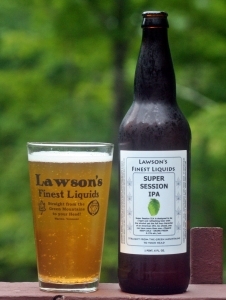 This is the third release of Lawson’s Super Session IPA each with a different hop variety. This is the only one I have tried and it uses Sorachi Ace hops. I wish I had a chance to try the first two varieties as Sorachi is not my favorite hop. Being a session IPA I expect it to be a little watered down and the appearance certainly looks like it will be. A light gold color with a very thin white head. Aroma is light with a little lemon. Taste is where this one loses me with only a bit of the lemon coming through, the rest is dill like which for me does not well in a beer. Mouthfeel was slightly watery which is to be expected for a 3.8% ABV IPA. Highly drinkable and pleasant but not nearly as good as the other beers I have enjoyed from Lawson’s. Brewers Description: Super Session IPA is designed to be a light and refreshing beer with low alcohol, yet the full hop character of an American IPA. Go ahead, you can have more than one… Cheers! 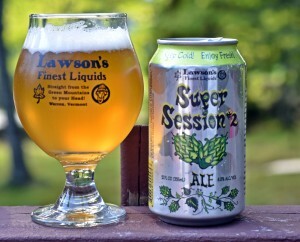 Lawson’s has been one of the hardest beers to find in Vermont for years. If you are lucky enough to be at the Warren Store on Thursday or Beverage Warehouse / Hunger Mountain Coop on Fridays you may have been able to score a bottle or two. A few months ago Sean started brewing Sip of Sunshine at Two Roads in Stratford Connecticut. This has made the beer more accessible as the deliveries of Sip of Sunshine are huge compared to the very small batches Sean brews at his home in Warren. The bottles lack the foil wrap that most Lawson’s bottles have and have a yellow label instead of the normal white label. Fortunately the quality of the beer didn’t change. Sip of Sunshine pours a deep orange with a nice white head that leaves plenty of lacing. The aroma is big and bright, tropical fruit and very dank. Taste is excellent and only a fraction below the famed Double Sunshine. Lots of tropical, citrus fruits to start and the finish is all herbal and very dank. This beer is incredibly complex for a double IPA. So much going on it hard to describe. Alcohol is well hidden and it does have a fair amount of bitterness which is to be expected. Great beer and it should be “easier” to find than most other Lawson’s offerings. Brewers Description: This lupulin-ladin India Pale Ale is packed with juicy tropical fruit character, bright floral aromas and delectable layers of hop flavor. Pour mindfully, inhale deeply and enjoy a tropical vacation in a glass. Always store cold, enjoy fresh and stay cool! 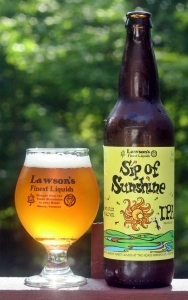 Sip of Sunshine IPA is brewed by Lawson’s Finest Liquids at Two Roads Brewing Co. in Stratford CT. Seems everyone is brewing a “session IPA” these days and some are far better than others. The style as a whole suffers from a watered down mouth feel and a lack of complexity. There are a few session ales that I enjoyed but for the most part they miss the mark. 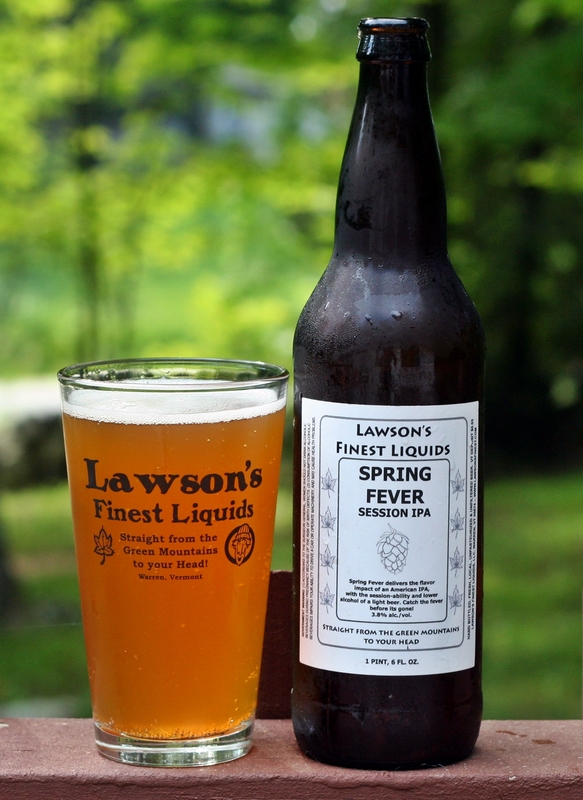 Spring Fever from Lawson’s ends up some where in the middle. With a very low 3.8% ABV I was expecting a watery mouthfeel which I got but was not expecting such a great hop aroma. This been pours a super clear light orange with a very slight white head. Aroma was very nice with plenty of tropical fruit and a bit of grass. Taste was OK with a decent hop profile but the beer felt like an IPA split with water. Enjoyable but I would rather drink a bottle of Double Sunshine than drink multiple bottles of Spring Session. Brewers Description: Spring Fever delivers the flavor impact of an American IPA, with the session-ability and lower alcohol of a light beer. Catch the fever before its gone! I really thought I was going to miss out on this one as I did not make the trip to Vermont on Memorial Day weekend to go to the Farmer’s Market release of Triple Sunshine. Fortunately while trading some beer with a fellow beer drinker he mentioned a friend of his had made the trip and had an extra bottle. After a few messages back and forth I ended up trading a couple of Hill Farmstead bottles for this bottle and a few cans of The Alchemist beers that were also released that weekend. Double Sunshine stands out as one of the best DIPAs I have tried; crisp clean and easy to drink even at 8% ABV. Triple Sunshine brings everything up a notch including the ABV to a whopping 10.5%. The appearance is a deep orange with a nice white head. Lacing is abundant and makes for a very enjoyable beer. The aroma lived up to my expectations with a big fruity sweetness; pineapple and citrus dominate with a bit of pine. Taste was big, bold and as balanced as a huge IPA can be. Loads of hops followed by a nice sweet finish with only a slight bitterness. There was some alcohol bite to it but I expected that with such a big beer. 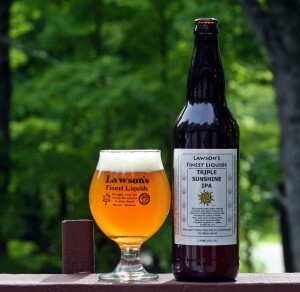 If you missed the bottles you may be able to try it at the Vermont Brewers Festival; that is if you were lucky enough to get tickets and are wiling to stand in what will almost certainly be very long lines at the Lawson’s booth. Overall I am very happy I got to try this beer and I hope that Sean decides to brew it again. Brewers Description: This lupullin-laden India Pale Ale is packed with juicy tropical fruit character, bright floral aromas, and exceptional layers of flavor. Store cold, pour carefully, then close your eyes and enjoy a tropical vacation in a glass. One of the oldest (Otter Creek) and one of the smallest (Lawson’s Finest Liquids) recently collaborated to brew Double Dose IPA. 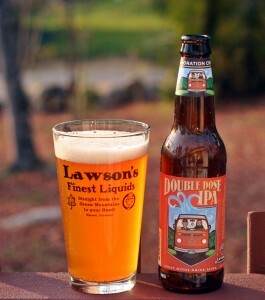 This is a double IPA brewed at Otter Creek and sold in 4-packs of 12 ounce bottles. Appearance is a very nice orange color with a thin white head. Aroma has tons of fresh hops; citrus and pine mostly. First taste made me think tangerine juice but it quickly turned into some resiny pine with only a hint of bitterness. This was a great beer and I am sorry I didn’t get more than a single 4-pack as I am sure all the local stores are sold out. Hunger Mountain Coop is one of three stores that sells Lawson’s Finest Liquids bombers and they teamed up for a 40th Anniversary beer to celebrate 40 years of the Coop. I grabbed this beer on a trip to the coop before the Hill Farmstead Harvest Festival event. This is one of the best Amber/Red ales I have had. The beer pours a nice brown color with single finger tan head. Aroma has a little bit of everything with some very sweet malts and a fair amount of floral, herbal and pine hops. The taste is excellent with the same mix of malt sweetness but still with a big hop punch. No idea if this beer is still available or if it will be released again under a different name but if it is you should attempt to find a bottle. This is the second really good amber/red ale I have had in just a couple of months with the other being Red Ryder from Earth Eagle Brewings. Glad I finally found some reds worth drinking. Brewers Description: A collaboration between Lawson’s Finest Liquids & Hunger Mountain Coop to celebrate 40 years of cooperation in our community. This dark ruby red Vermont-style Extra Special Ale is brewed with Pale, Carapills, Caramunich 120, and flaked barley malts to complement a wealth of Simcoe, Citra, Cascade and Centennial hops! 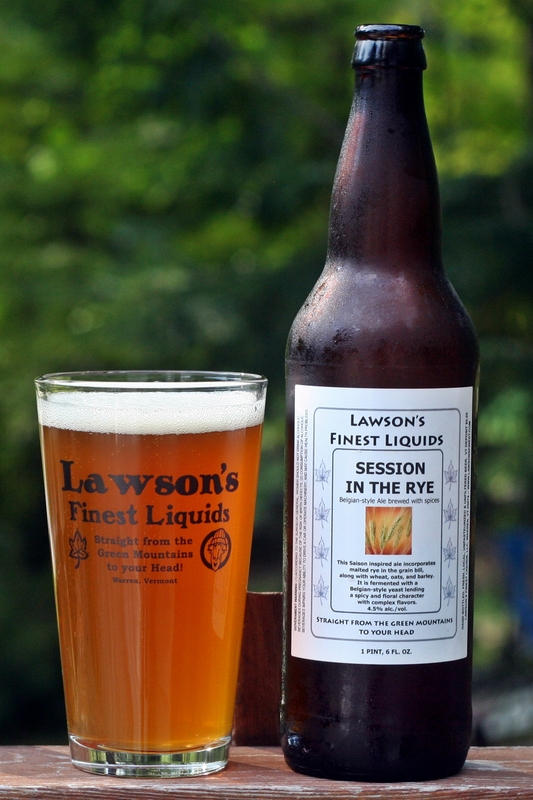 Seems a lot of brewers are starting to use rye in the brew process and it can make for some interesting flavors. 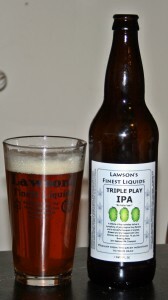 I ended up swapping a bottle of Smuttynose Strawberry Short Weiss for this bottle of Lawson’s. When I was in Vermont last month the only bottles available were Knockout Blonde and Double Sunshine so I was glad to find someone with a bottle of this for trade. The beer pours a deep orange with a small white head. Almost no lacing from but retention was good. A fair amount of aroma from this one including lots of spice and some hops which surprised me. 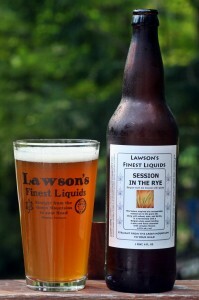 The rye gives this one a complex flavor including a fair amount of spice but also some citrus hops. I was not expecting a hoppy beer with this but was pleasantly surprised. The beer finished smooth with minimal aftertaste and being a fairly low ABV the bottle was finished fairly quickly. Really enjoyed all 3 bottles I had the chance to try from Lawson’s and hoping I can score more when I go back to Vermont in less than a month. I heard about this beer a few months ago when it was being brewed and before my trip to Vermont. 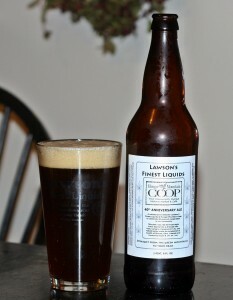 After trying a couple of Lawson’s beers and all the varieties from Maine Beer Company I knew this would be a good beer. Ended up grabbing 4 bottles from The Vault in Lewiston and I believe as I write this they still have a few bottles left. The first thing you will notice is the appearance; dark brown almost black color with a thick head that rises well above the rim of the glass. Almost looks like a root beer float. Aroma has some nice roasted malts up front followed by some citrus. The taste is very interesting with those roasted malts coming through with some coffee/chocolate but then the hops kick in and finishes with a nice bitterness. Very interesting taste and mouth feel as it has plenty of malt character but also a nice hop bite. Many black IPAs just seem to be darker colored versions of your typical IPA but that is not the case with this one. It has the hop flavor but also lives up to the color. An excellent beer all around and something you should try to find if you have not already had it. 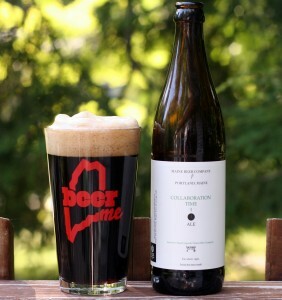 Brewers Description: A hoppy American dark ale incorporating New England-grown barley, wheat, rye, and whole cone hops. Special thanks to Valley Malt for malting up the special batch of local Chocolate Rye and Crystal Wheat.